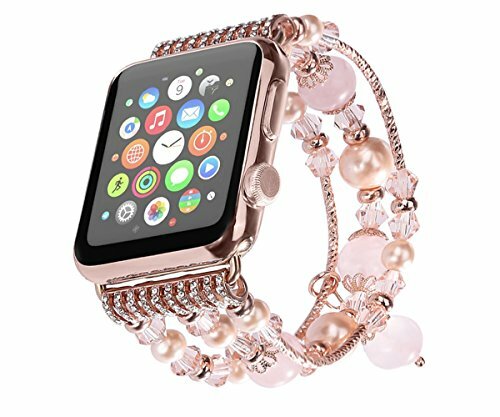 It is a very beautiful apple watch band. design is awesome. Apply to: Apple Watch Band series 1, series 2, series 3 Edition, Sports, all version. Beautiful Fashion Beaded Gemstone Bracelet Made of high-quality natural stone, durable elastic rope, uniquely stylish, Contracted design style, with you life contracted and not simple, also is a good choice as gift. Please note: Please note that the way to wear, do not wrap, please measure the wrist before buying, this 38mm size bracelet length of about 7.1 inches (including watches and bracelets together), the proposed wrist size of 5.7 inches and 6.8 inches, and 42mm The size of the bracelet is about 18.5 cm (including watches and bracelets together), so if the wrist is larger or smaller, the recommended wrist size is 5.7 to 6.9 inches and the elastic thread may be louder. According to our statistics, 99% of women fit. Kindly Note: Please note that the way to wear, cannot be Winding, Please measure your wrist before purchasing it, this 38mm size bracelet’s length is approximately 7.1 inches (including watch and bracelet together), so recommended wrist size is between 5.7 inches and 6.8 inches which shall fit perfectly, if you have a bigger or smaller wrist, maybe the elastic cords will be tighter or looser. According to our statistics, 99% women and girls suitable.